We decided to take advantage of a glorious Brisbane afternoon and take the kids for a stroll along the Kangaroo Point Cliffs. We were not the only ones that afternoon to have the same idea. We saw fitness fanatics warming up before their run, abseilers scaling down the cliffs, families getting together and couples enjoying a romantic moment. We even saw a purple stretch hummer, music blaring, pull up at the Kangaroo Point Parklands for a toilet break. Kangaroo Point is located on the Brisbane River opposite the CBD. The cliffs extend south from the Story Bridge and are a short walking distance to the South Bank Parklands. There are several lookouts along River Terrace offering stunning views of the Captain Cook Bridge, the Botanic Gardens, the Brisbane city skyline, the Story Bridge and Mount Coot-Tha in the distance. We started our walk from Scout Place, a beautiful stone lookout shelter, and continued along Upper River Terrace at the top of the cliffs. 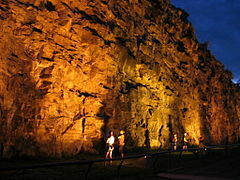 Lower River Terrace, at the base of the cliffs, winds along the Brisbane River. Both upper and lower terraces are well equipped for picnics with electric barbecues, tables, toilets and of course, spectacular views of Brisbane. The lower terrace also features some interesting sculptures scattered along the path. Captain John Burke Park, a playground and excellent picnic spot, is directly underneath the Story Bridge. If you follow the upper River Terrace like we did, you will eventually come to the newly developed Kangaroo Point Parklands. These parklands were built recently on the old Tafe College site. At the far end of the parklands is St Mary's Anglican Church, a striking stone church built in 1873. This church was tucked away, hidden between Tafe and St. Vincent's Hospital, until the parklands were developed. They welcome visitors to stop in for a quiet moment of reflection or to say a prayer. There is also a new cafe sitting atop the cliffs at the new parkland. The Cliffs Cafe is open seven days a week from 7 am until 5 pm. You don't have to eat at the cafe though, there are barbecues and lots of picnic tables available so you can pack your own picnic. There is plenty of green space with soft rolling hills to keep the kids amused. Our kids loved rolling down these gentle slopes. They also loved the striped worm sculptures featured throughout the parkland.